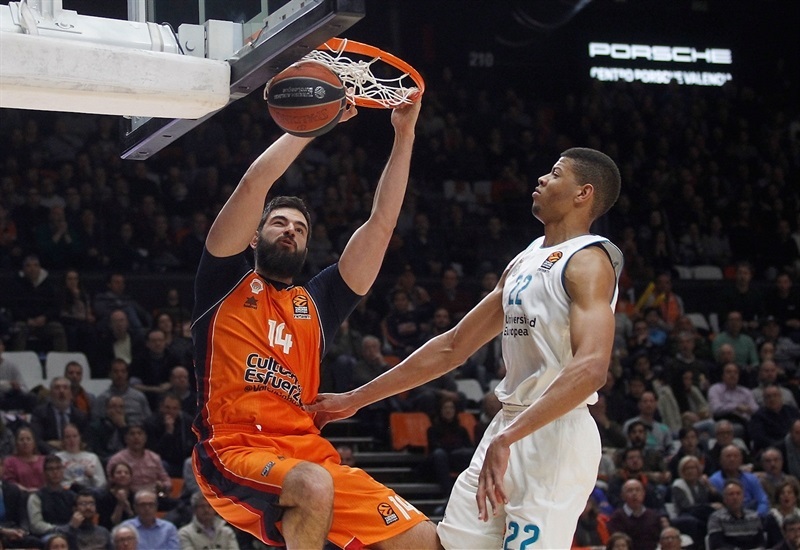 In an all-Spanish showdown in the Turkish Airlines EuroLeague, Valencia Basket bested Real Madrid 96-88 at home on Tuesday. 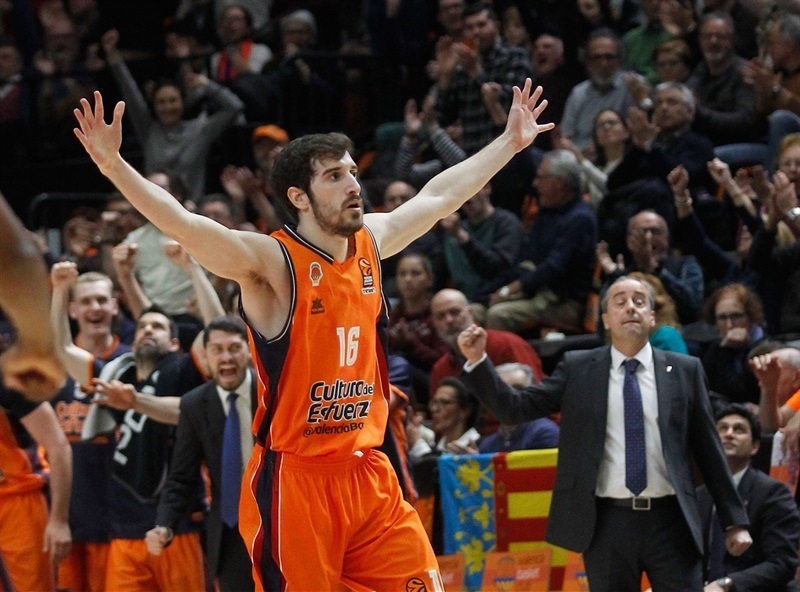 Valencia improved to 10-17 in the standings and Madrid dropped to 16-11. Despite the loss, Madrid had reason to smile; Los Blancos qualified for the playoffs earlier when Fenerbahce Dogus Istanbul topped Maccabi FOX Tel Aviv. 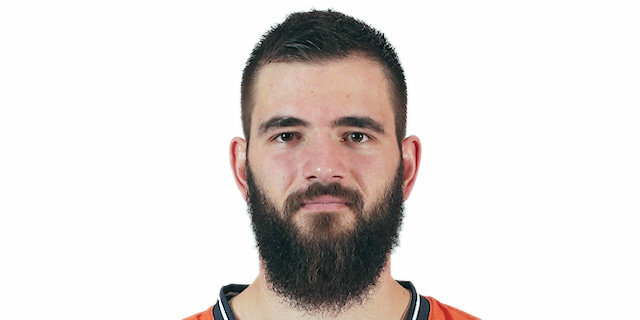 Bojan Dubljevic led the winners with 17 points, Tibor Pleiss added 14, Rafa Martinez 13, Joan Sastre 11 and Sam Van Rossom contributed 10 points and 5 assists for Valencia. 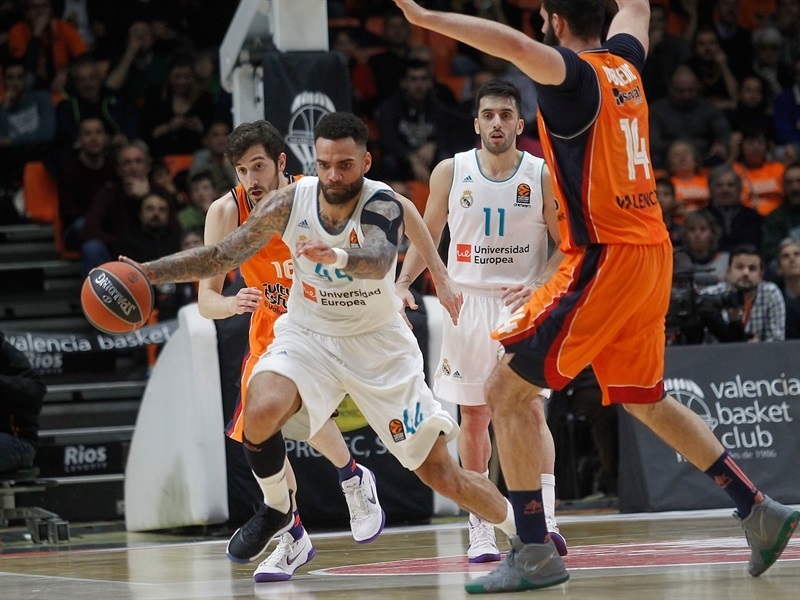 Facu Campazzo and Jeffery Taylor led Madrid with 17 points apiece. 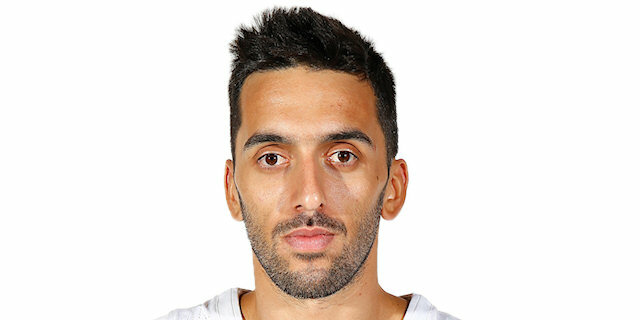 Campazzo added 12 assists for a double-double. Trey Thompkins added 14 points and Fabien Causeur 12 for the visitors. 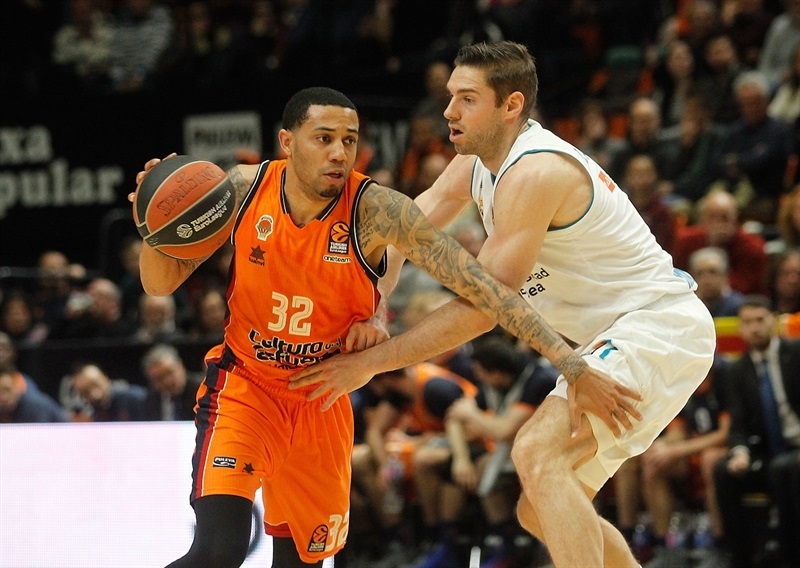 Valencia led 46-40 at halftime and behind contributions from Pleiss, Erick Green and Guillem Vives extended its margin to 70-60 after 30 minutes. 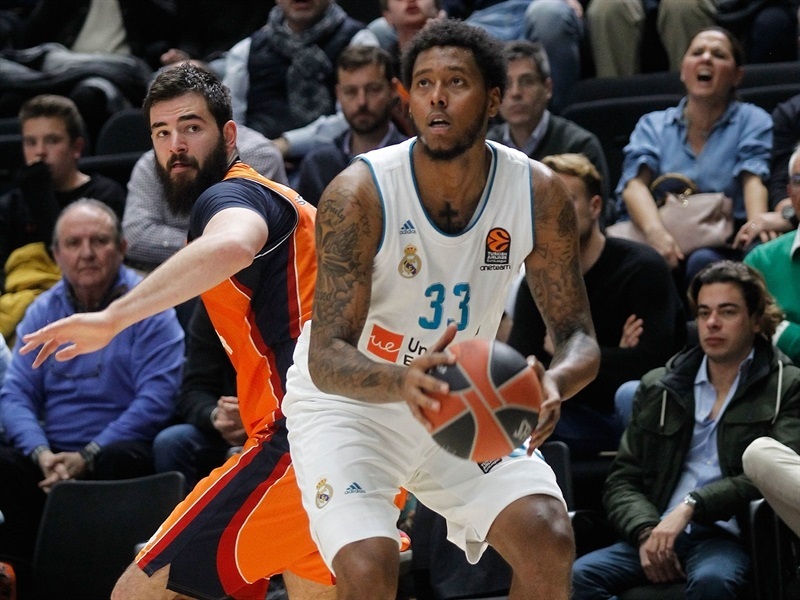 Madrid managed to get within 80-75 on a three-pointer by Trey Thompkins but Sastre stepped up in crunch time with 9 quick points, including a couple of three-pointers, to seal the outcome. Dubljevic got Valencia going with a three-pointer and a put-back layup, but back-to-back baskets by Carroll drew Madrid within 5-4. 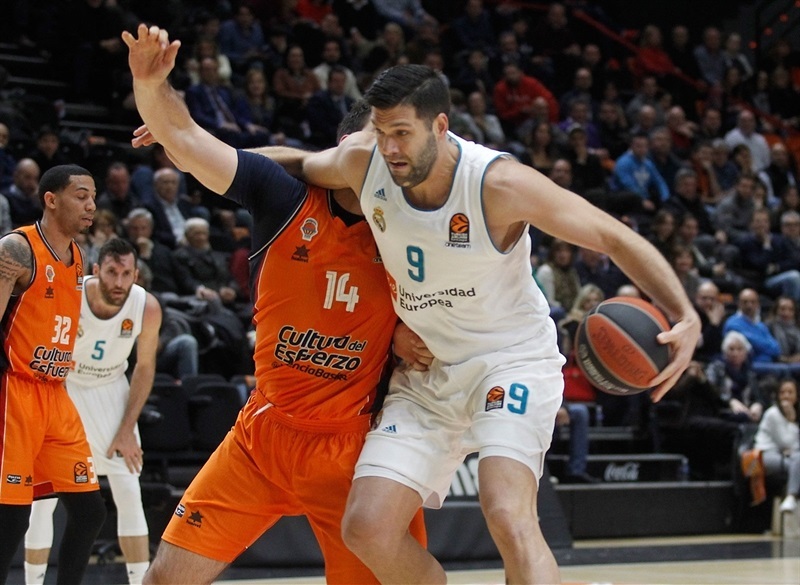 Campazzo bettered Alberto Abalde's jumper with a triple, but Dubljevic dunked in a 7-0 run which Martinez capped with a triple for a 14-7 Valencia lead. A jumper by Carroll ignited a 0-7 run that Anthony Randolph capped with a tip-in for a 14-14 tie. Martinez continued from downtown and a jump hook by Will Thomas restored a 19-16 Valencia lead. Taylor buried his second three-pointer and a dunk by Walter Tavares gave Madrid its first lead, 19-21. Pleiss struck from downtown as Valencia regained the lead, 22-21, after 10 minutes. 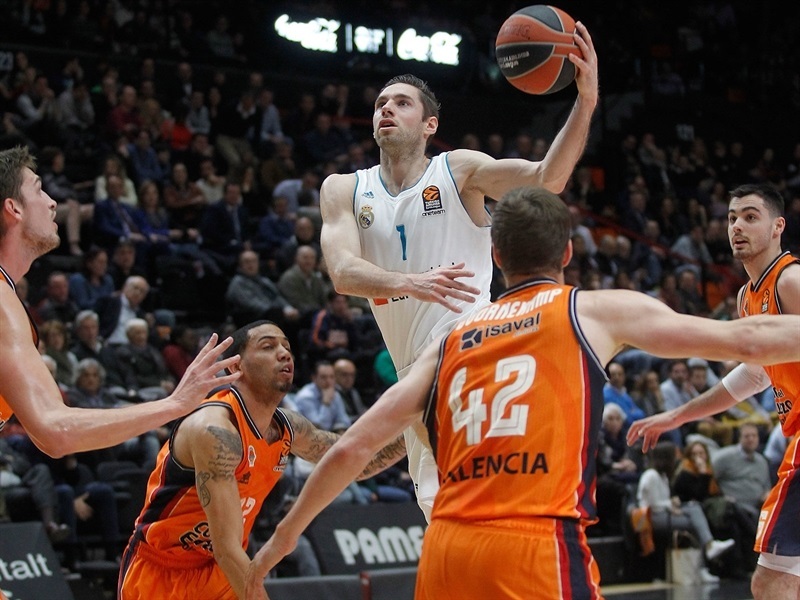 Aaron Doornekmap joined the three-point shootout early in the second quarter and Van Rossom added a driving layup, but Campazzo kept Madrid close at 27-24. Doornekamp hit another triple, Van Rossom scored in penetration and Pleiss followed a jumper with a dunk to make it a double-digit game, 36-26. 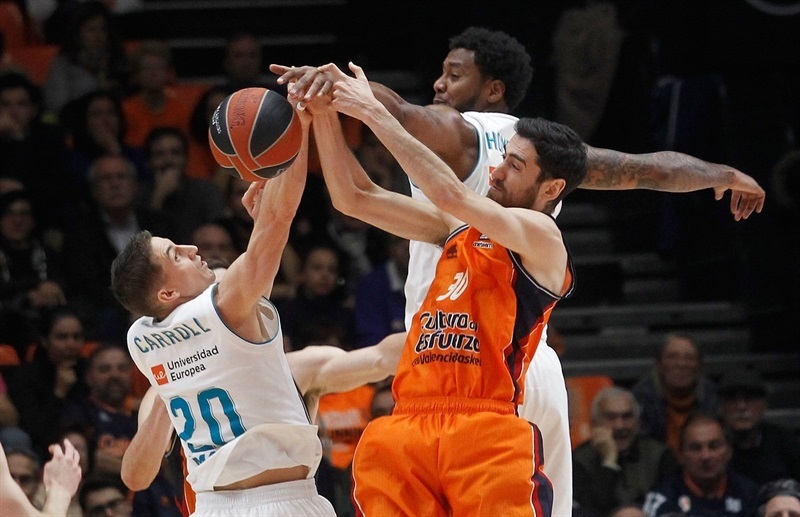 Three-pointers by Thompkins, Rudy Fernandez and Carroll brought Madrid a bit closer. A tip-in by Taylor and a buzzer-beating layup by Dubljevic fixed the halftime score at 46-40. Van Rossom and Dubljevic fueled a 7-0 run that Martinez capped with a reverse layup for a 53-40 Valencia lead right after the break. Taylor followed a floater with a dunk off a steal and got help from Gustavo Ayon to bring Madrid within 55-47. Green stepped up with a three-pointer and a layup, but Taylor and Causeur each struck from downtown to make it 60-53. 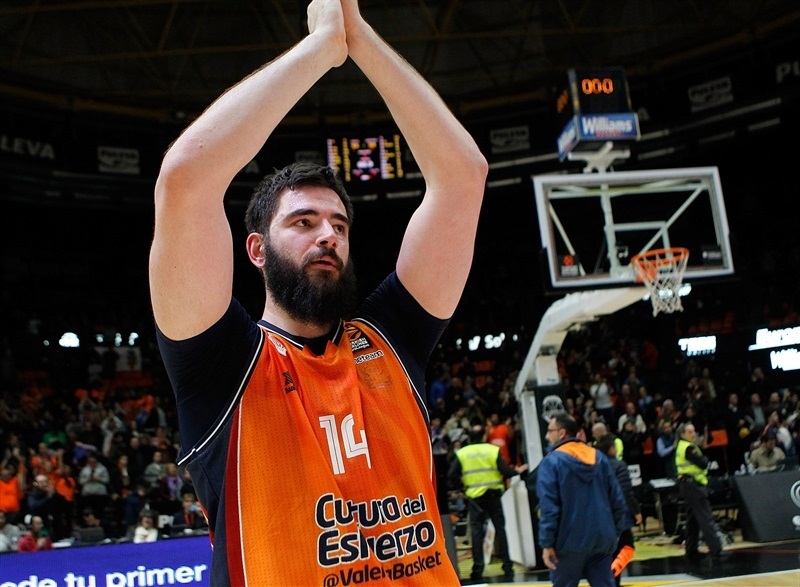 After Dubljevic scored down low, Taylor and Pleiss traded dunks and back-to-back three-pointers by Guillem Vives boosted Valencia's lead to 12. Randolph dunked to make it 70-60 after 30 minutes. A wild three-point play by Campazzo and a layup by Causeur caused Valencia to call timeout at 70-65 early in the fourth quarter. 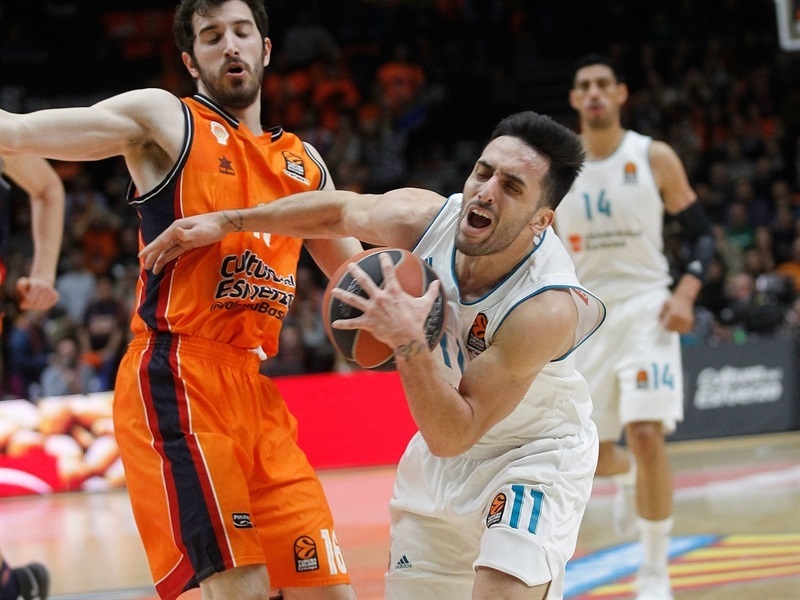 Sastre struck from beyond the arc and a tip-in by Pleiss gave Valencia fresh air at 75-65. 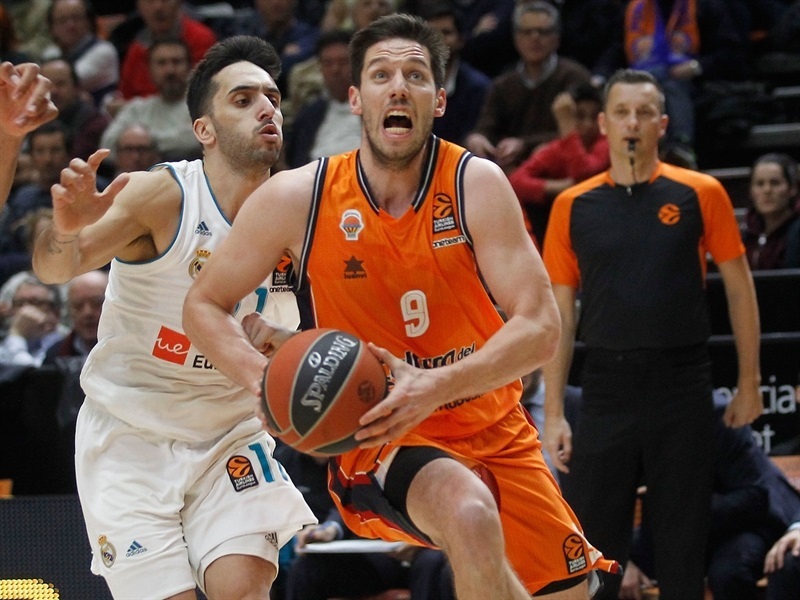 Causeur kept pushing Madrid and three-pointers by Fernandez and Thompkins got Madrid as close as 80-75. Thomas hit a big triple and free throws by Sastre prompted a Madrid timeout at 85-75 with three minutes left. Sastre added another three-pointer and Martinez made free throws to seal the outcome in the next-to-last minute. "We played a great game. Our work on defense and offense was fantastic for 40 minutes; we controlled the defensive boards very well and limited their fast break points. We played with confidence for all 40 minutes, sharing the ball, attacking their weak points and with 10 players scoring three-pointers; this is not usual and shows our great mentality during all 40 minutes. Of course, we are very happy for this important win for us. I think my team did a fantastic job. All the players performed at a high level. Erick [Green] reached halftime scoreless, but with plus-9 in plus-minus, meaning that he put a great effort out there and after that, he scored important baskets in key moments, which allowed us to keep a safe lead. Of course, all other nine players had brilliant moments during the game. Nobody backed down when we made mistakes. We played so many games that I don't know if this is the best this season, but it is one of the best. We have the ability to keep playing like this as long as we can bring back players. Sam [Van Rossom] came back and Guillem [Vives] got better and Alberto [Abalde] keeps playing at a high level at the start of the games, with a great level of performance and focus. 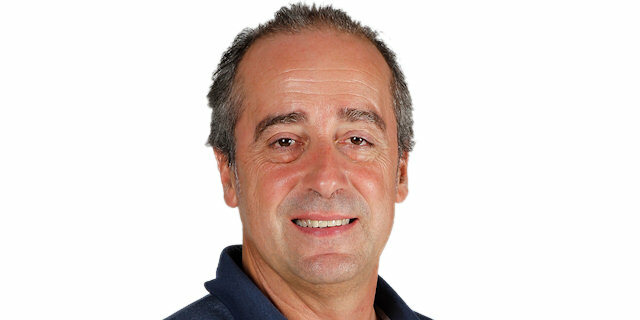 That allows us to have something we didn't have most of the season - knowing who runs the operation at full speed. Sam and Guillem are still far from their best level, but we are optimistic because Alberto is doing a good job and Sergi [Garcia] will also help us be at our maximum level. The team is growing, of course, through our point guards' return, but even though it is hard for us to seal the outcome sometimes, we played at a very high level. All 10 players who stepped on court played with good mentality and give a maximum effort." "First of all, congratulations to Valencia for their victory. I think it was a game in which we had a lack of intensity at the beginning of it, when they had some little advantages, but we were able to come back. I think we did a good job in the second half, but in the end, if you look at the stats, there are two clear situations that made the difference in this game: their percentage from the three-point line and our terrible free throw percentage. We are talking about a game that was decided by 8 points in which they scored 15 three-point shots with 50% and we missed 8 free throws. I am not happy because I think we could have done some more things to win this game, but we knew Valencia has a lot of talent and it was going to be a hard game. We will try to move on fast and think about the next one, which we will play in a couple of days. We reached our first goal [of qualifying to the playoffs] and right now we are the only Spanish team qualified to the playoffs, which speaks well about the work we did all season. I am proud that the team, despite our many problems during the season, has always been very competitive. We are one of the best eight teams in Europe and lead the Spanish League standings; it looks like I am trying to sell my team, but it is the truth. I am very happy with my players' work. I always think we can do things better, but I am happy that we qualified and now, we will fight for the best spot available, which would be trying to get the home-court advantage in the playoffs." "It is a big, big win for us. We played against one of the best teams in Europe. This is a good win because it is good for our confidence, but we cannot relax because we are travelling to Milan tomorrow to play another important game which we will try to win. We played like a team, shared the ball and every time we do that, we can beat any team." "We paid a high price for our first half and our lack of concentration, adding to the fact that Valencia was very efficient on offense. I believe that they punished us a lot. We tried to fight back, but they kept a big lead until the end, so it was really tough. We have to keep calm and go step by step. Our next game against Zalgiris will be like a final, a key game for us. We cannot think of any other game but this, turn the page and correct the mistakes we made to avoid making them again on Thursday. It is a final for us and we play at home, so we have to take advantage of that."